Special Needs Aquatic Play. Children with special needs and their families are invited to play and socialize in an informed and fun filled environment. Free to all families with Special Needs. Parent and/or another responsible adult is strongly encouraged to accompany child inthepool. Withanumberof volunteers, we spend approxi- mately one hour in the Activity Pool. Thoseswimmersableto pass a swim test are able to utilize that Lap Pool with su- pervision. For the last 30 min- utes, we utilize the cafeteria for snacks donated by families and volunteers. We realize that some participants may have special diets and/or food re- strictions, so we ask that you bring something from home for your child on the first visit. In addition to our six lane lap pool, we also offer a separate recreation pool for family use. A certified lifeguard is on duty at all times the pools are open. We offer a variety of classes from child and adult swim lessons to aqua fitness during our morning hours. 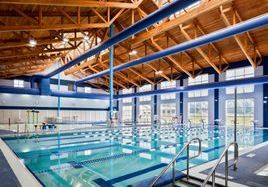 For safety purposes, children under 14 must be have an adult in the facility, while children under the age of 8 are required to be supervised by an adult on the pool deck. The Aquatics Center swim lesson program is centered on five main components: personal safety, personal growth, stroke development, water sports and games and rescue. The emphasis is on progressive learning, using a student centered and developmentally appro- priate approach to teaching. Our goal is to help children build confidence and skills through positive reinforcement, promoting life long health and fitness. We offer an array of classes for partici- pants ranging from six months old through adults and varying levels from beginning through advanced. In order to ensure the safety of our swimmers, it may be necessary to close the pools during inclimate weather. In the event of a closure, Lifeguards will make the announcement to clear the pools, at which time, swimmers should exit promptly. When the storm passes, or thirty (30) minutes after the last thunder heard and/or lightning sighted, Lifeguards will announce when it is safe to re-enter the water. Please note, this policy has been created in alignment with the policies created by the NCAA, and the National Athletic Trainers Association. Any questions and/or concerns relating to this Inclimate Weather Policy should be directed to the Site Director, Katelyn Dauphinee, at KDauphinee@escnj.us.